Mikrotik RB750GL - Mikrotik Router Board RB750GL is a mini router that suitable for SOHO (Small Office / Home Office) routers. 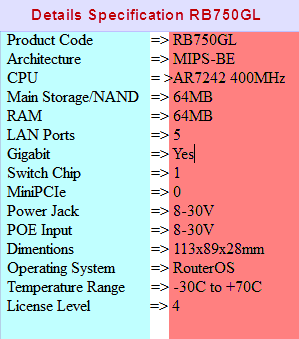 With low prices, RB750GL have 5 ports Gigabyte Ethernet 10/100/1000 , a 400 MHz processor and 64 MB of memory. This equipment uses the RouterOS with license level 4 which in its characteristics allows even the compact RB750GL can manage an entire network without difficulties. 0 Response to "Mikrotik rb750gl Specification"